The 1959 movie Plan 9 From Outer Space is often described as the worst science-fiction movie ever made, or even the worst movie - period. 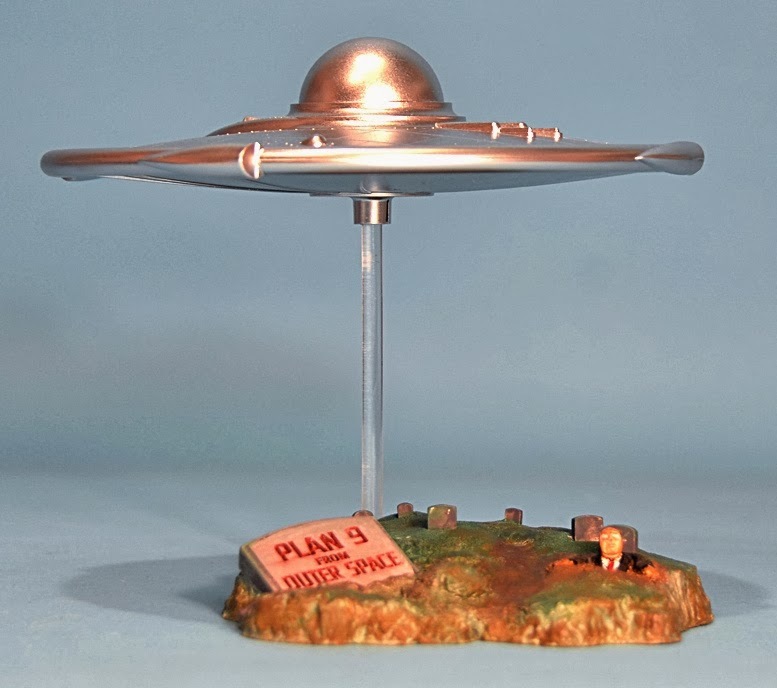 However, it has gained a certain cachet of its own, witness this Skyhook Models 1:48 scale diorama base, designed to be used with the Lindberg Flying Saucer, as used in the movie. 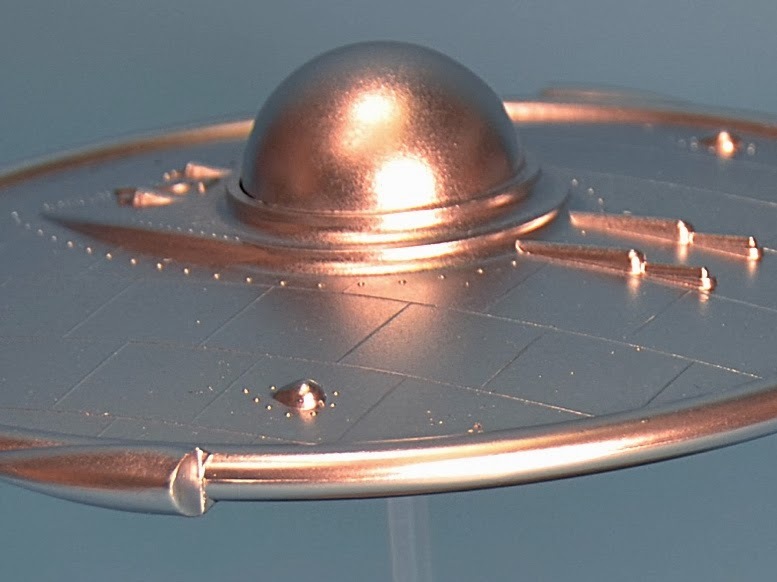 Mat Irvine makes the model: As the diorama has just two parts - base and transparent saucer support rod - it’s a paint-and-finish job, rather than an assembly issue. For all that, Skyhook has provided a decent product - sculpted by Dave Bengel - that comes complete with built-in nameplate and ghoul figure. The diorama depicts one of the scenes in the film, in which a dead policeman, Inspector Dan Clay, played by Tor Johnson, rises from the grave - as by that point in the plot, he has become a ghoul. As modelled here, the Skyhook figure look ‘a bit’ like Clay, but certainly looks ghoulish, and it’s your painting skills that will turn the plain resin moulding into a believable finished miniature. What you get and what you need (below). The Skyhook Custom Base and acrylic rod (left) and a Lindberg Flying Saucer. This is one of the original kits from 1954, but there are more recent issues. The Flying Saucer has just two main parts, the top and bottom. For this Plan 9 version, the engines and pilot are not required. The UFO spacecraft is not provided in the Skyhook kit: instead, you get a clear piece of acrylic rod on which to support such a craft. 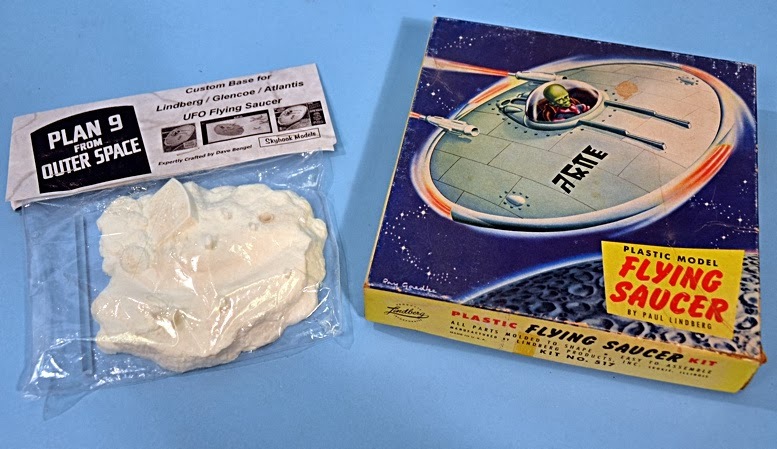 The reason you don’t get a UFO is that the movie used Lindberg Flying Saucer kits, so all you have to do is to get hold of one of the several issues of this kit, and make your own SFX miniature. 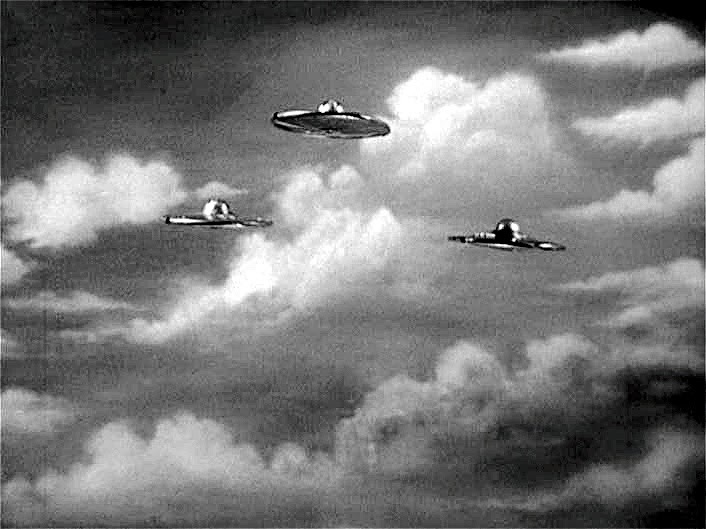 Three other Plan 9 Flying Saucers. Below (top) a Lindberg release, moulded in glow-in-the-dark plastic. Glencoe Models (middle) and (bottom) the current issue from Atlantis Models. So to complete the Skyhook diorama, there is plenty of choice where it comes to a suitable UFO. Besides the several Lindberg issues, the kit has been released by Glencoe Models, and most recently by Atlantis Models. Assemble as per the instructions, by simply cementing the top and bottom halves together, followed by adding the domed canopy. Leave off the two engines, and you don’t even need to install the alien pilot figure, as the clear canopy should be painted bright silver, along with the rest of the craft. 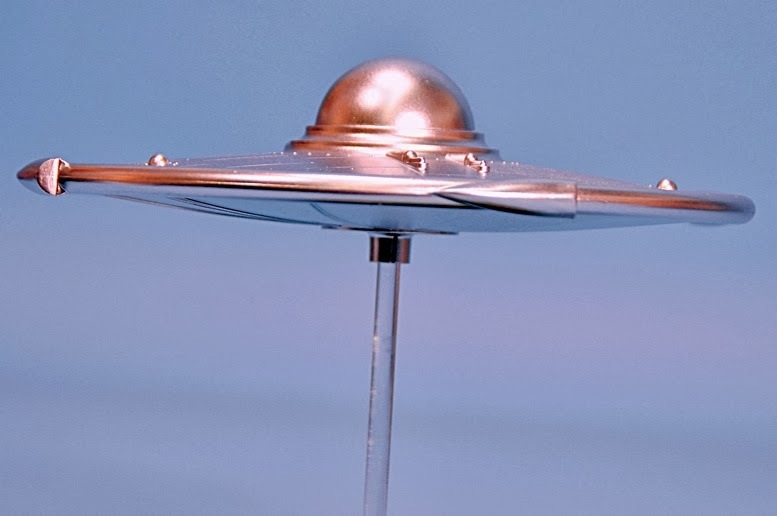 Fix the finished UFO to the clear rod, and you have your own small memory of 'Plan 9'. 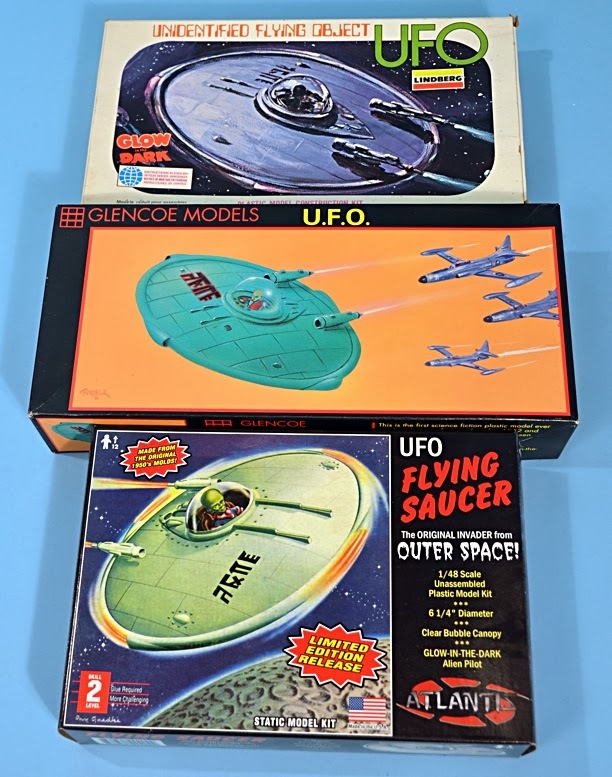 The Lindberg Flying Saucer (aka UFO) is the first ‘space’ subject to be made as a conventional injection-moulded plastic kit. Initial calculations had its first release in 1952, but recently Andy Yanchus, kit historian and past Project Manager at the original Aurora company, recalculated the date as 1954, using catalogues and advertisements in comics of the period. By that time there were other space kits coming onto the market, from Hawk, Monogram, and Revell, but the earliest of these was 1955, so even though it has slipped by a couple of years, the new date of 1954 still retains the record. 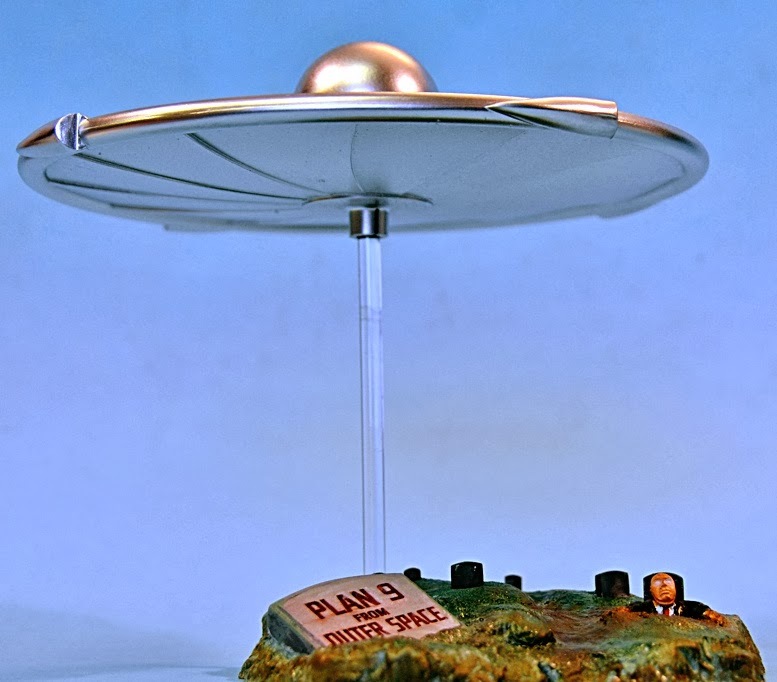 For many years Plan 9’s saucers were quoted as being made from 1950s-era Chevrolet hubcaps, an urban myth that was not helped by the 1994 Tim Burton movie Ed Wood. Although excellent in most respects, Wood (played by Johnny Depp), was shown with his girlfriend, Kathy O’Hara (Patricia Arquette), painting Chevy hubcaps. 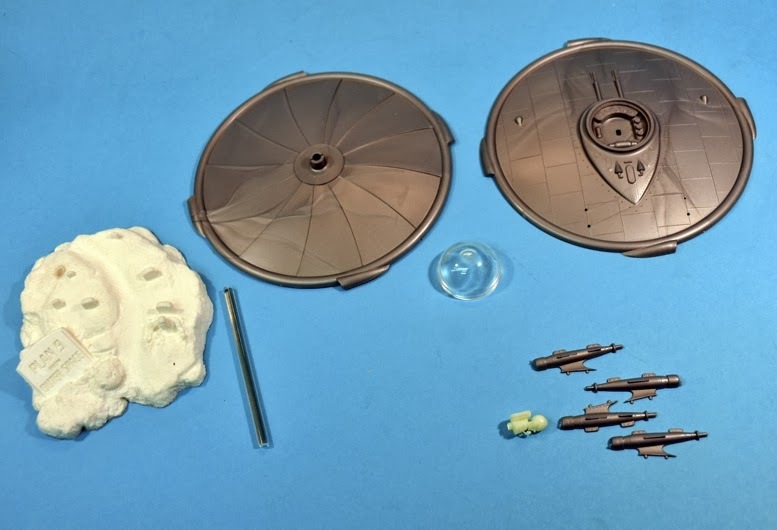 But close inspection of Plan 9 reveals that the alien craft are indeed Lindberg kits, minus engines, and painted silver overall. 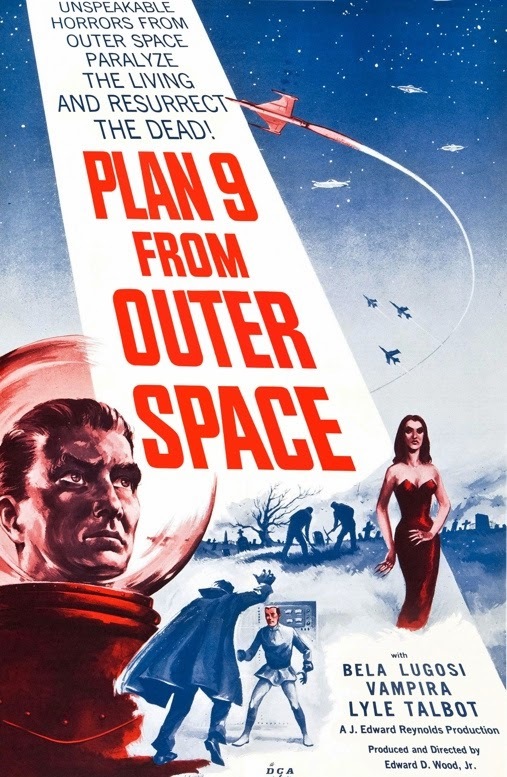 Plan 9 (as it is usually termed) was written and directed by Edward D Wood Jr (1924-1978). He also edited, co-produced and appeared briefly in it, and who can be summed up by saying that his movies were so bad, they were good. The plot tells of extraterrestrial beings that want to stop the Earth from developing doomsday weapons, which could destroy the whole Universe. To this end they create the ‘Plan 9’ of the title, to resurrect dead bodies as zombies, though in the movie they are termed ghouls. In fact, the original film title was Grave Robbers from Outer Space. 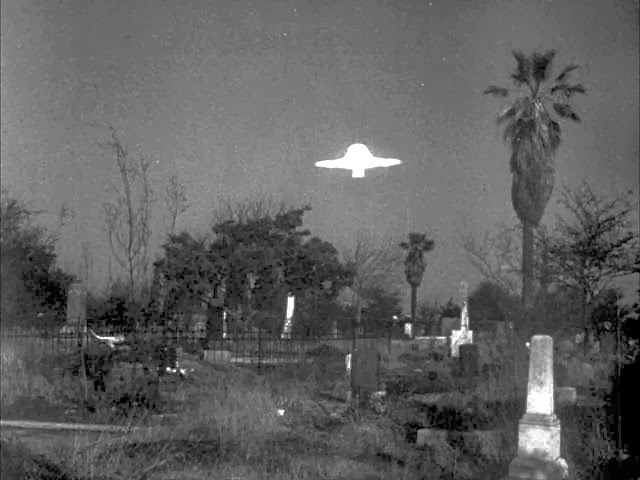 Stills from the movie (above, below) show cemetery and saucers. As a follow-on to the movie’s dubious accolade, and borrowing The Simpsons’ Comic Book Guy’s usual catchphrase, “Worst movie - ever…” this may not be entirely fair. Yes, many aspects are not very good, special effects invariably being singled out, along with the script, plot, acting and continuity (lack of!). But many of these are probably no worse then other American B movies of the time. 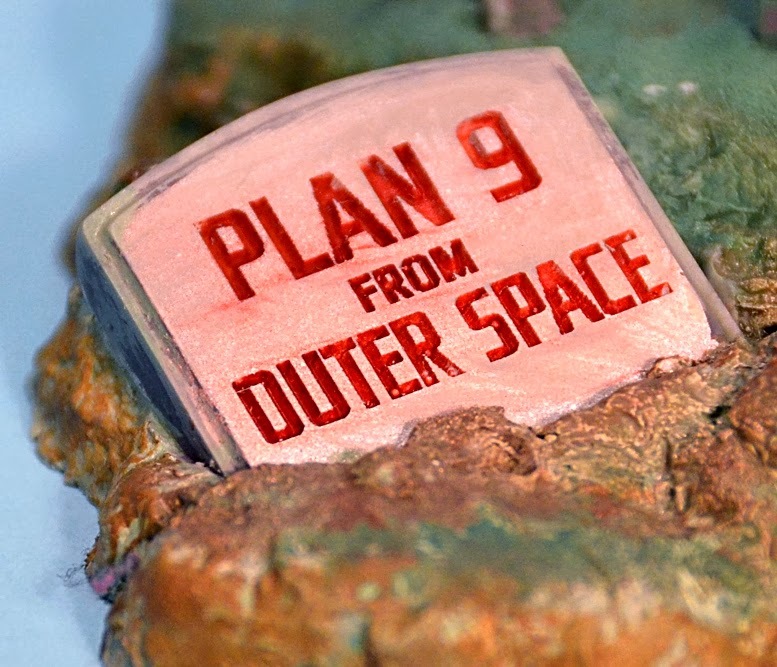 In fact, Plan 9’s storyline is arguably slightly better than some others, and does have an overall humorous charm to it. However, Edward D Wood Jr regarded himself as a serious movie autor, so whether he actually intended this is definitely up for speculation. He was, after all, posthumously nominated by the Golden Turkey Awards, as the ‘Worst Director Of All Time.’ But that, of course, only increased his cult status! Diameter: 130 mm (5 in) diameter. Height: 130 mm (5 in) with UFO in place. 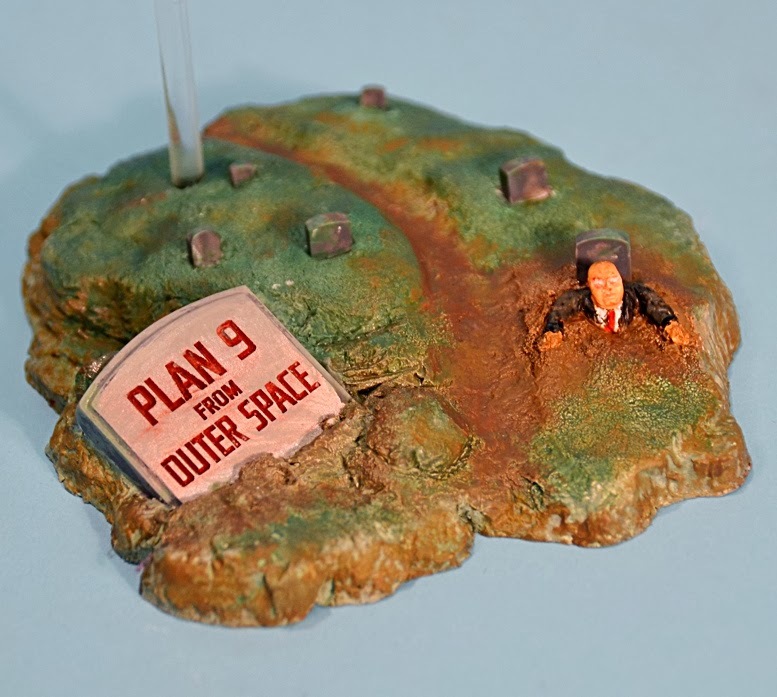 Custom base for Plan 9 from Outer Space is available direct from Skyhook Models.